This post was originally published on Sept 12 -2006. I am reposting it with updated pictures which I clicked this time. This is a dish loved by all the Konkanis who like Mackerel. This dish gets its amazing taste by the method it is prepared. Everybody at our native grows turmeric during monsoon. 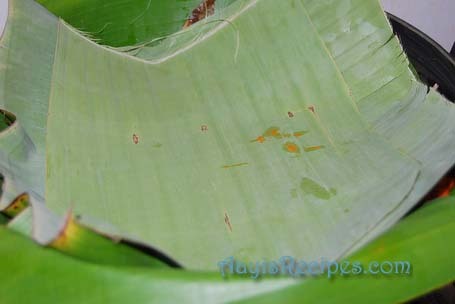 Basically it is grown for the aromatic turmeric leaves which are used in many traditional dishes. I must admit, some people absolutely hate this aroma. The leaves are even added to milk, while boiling, to give the distinct aroma. 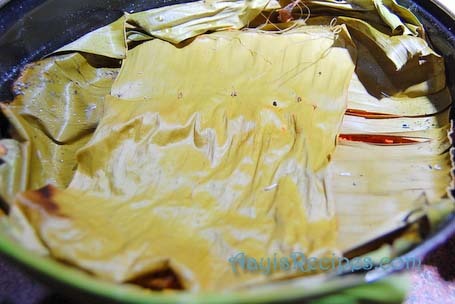 If people cannot stand the aroma, they use banana leaves. Few dried leaves are used when fresh ones are not available. That too taste great. 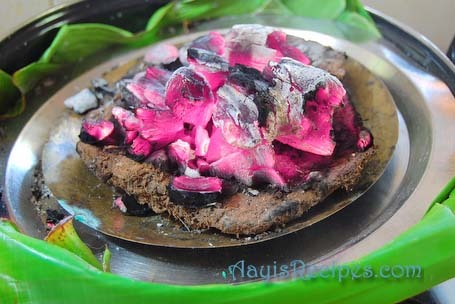 The traditional way of doing it is, spread the leaves in kadai, pour the masala with kokum, tirphal/teppal and fish pieces on the leaves. 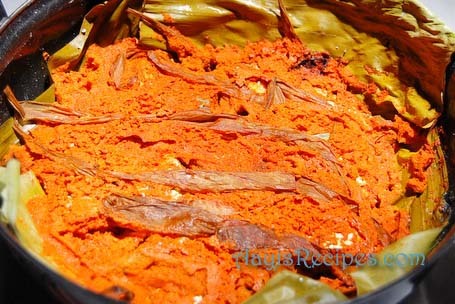 Then cover the masala with one more layer of leaves. Cover the dish with an plate. Spread some hot charcoal(ingalo) on the plate and cook on a low flame. Most of the time, instead of charcoal, a round ‘sheni‘ – which is a very common combustible material, is used. In this way, the dish gets cooked from both sides and retain the aroma. 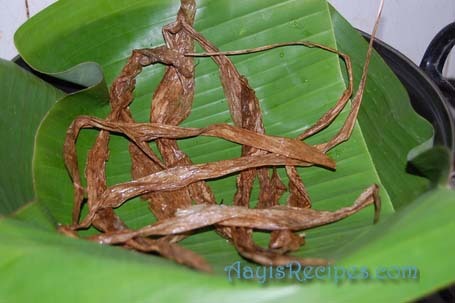 Since it was not the season this time, aayi used few dried leaves and few fresh banana leaves for making this. It was out of this world. We ate this dish after a very long time and thoroughly enjoyed it. If kokum is not available, use tamarind. If teppal is not available, this dish can be prepared without it. But the leaves are necessary, if none of the leaves are available, do not attempt to make this dish since you wont get the actual taste of it. Grind coconut, turmeric, ginger and red chillies to a very smooth paste (with very little water). 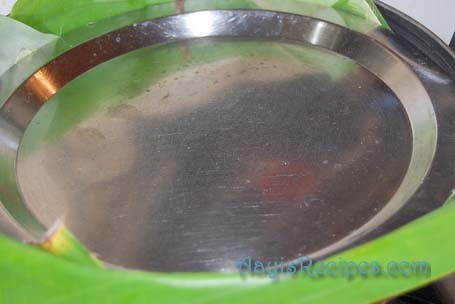 In a heavy bottomed pan or non stick pan, spread banana/turmeric leaves. Add the masala, slightly crushed teppal, kokum pieces, salt and fish pieces. Mix gently. 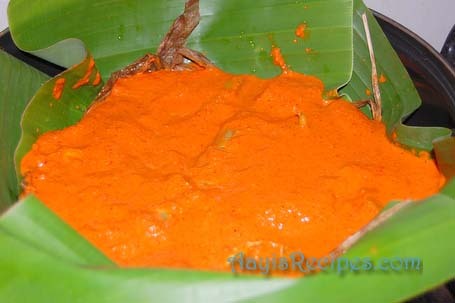 Spread banana/turmeric leaves on top. Spread some lighted charcoals on top. Cook for around 15-20min on a very low flame. (Prepare this dish at least 2-3 hours before serving). Shilpa,may i know what is Mackeral? is by any chance is it a type of fish? it looks one..sorry if i have asked it wrong.. Yes Sudha. It is a type of sea fish. You might have heard ‘bangude'(kannada) or ‘bangda'(hindi). I am not sure what kind of fish I can substitute Bangda with. But this sounds great. Will try it soon. Mandira, I heard another fish called “soundale” can also be used for this, I don’t know the English name though. Another very famous version is tarle(sardines) dhoddak. Bangda is usually available here in Chinese stores. Sree, thanks. Yes, I am Konkani. hi shilpa i looked for soundale receipes all over the net but could not get pls send me some . Is is the fish Soundale(Konkani name) you are referring to? Good to see yummy Konkani recipes in the net. My aunt used to talk abt “raja dhaddak”. I will try it out this weekend. Whenever you grind cocoanut make sure you use warm water. Results are better. I make dhodak in the oven and it tastes just fine.I use a square pyrex baking dish. Last few times, I have been using dried haldi pan and the aroma was just heavenly. I totally agree with you that the haldi pan makes all the difference. But I like this dish so much that I have done it many times without the pan. WOW! Thanks for republishing this Shilpa, missed it the first time…. I don’t really like the Mackerel here, but I am loving the recipe! I love Bangde. I have moved to US very recently. Can you give me some pointers if and where Bangde is available here? And also about crabs. I have seen here something called cooked crab legs. Can we use that directly for our dishes? Shilpa: Nayan, look for some Chinese stores for our kind of fish/crabs. I have bought fish/crab from Chinese store many times and they were very good. I have never used the cooked legs as they look so huge and scary. I have tasted them in some non-Indian restaurants here and I hated them. This dish pulls together beautifully! Wow..Shilpa..new way of making Bangda..never knew of this one! Tks for sharing! Amazing write-up & a lovely dish, never heard of it before though. Don’t know when I’m going to try it out, but once I do will surely let you know. your banda dhoddak is making me drool !! its just like the way my ayee makes…i love it with coconut oil drizzled on top….simply heaven ! tx for the fabulous job u r doing..
Wow, truly authentic, from the haldi pan to the charcoal, to the masala n teppal..What a big difference in the color of the masala we make here and in India. Dhoddak looks just superb!! So nice to see some authentic recipes. Bangda looks so fresh…Donâ€™t know when Iâ€™m going to try it out, but once I do will surely let you know. Thanks for sharing. 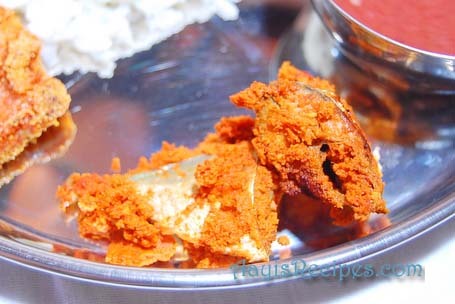 Yummmyyyyyyyyy….Feel like diving in to that plate and gobbling it all up…Indeed Konkani food is divine!!!! OMG! Look at that gorgeous red color of that gravy!! Beautiful dish! please tell me what todo as charcoal is not available Should i turn over the fish after some time? Shilpa: Shobha, last time when I made it here in US, I followed all other steps exactly(I was not having turmeric leaves, but banana leaves were available), just omitted charcoal. Keep it on a medium or low flame and close with a tight lid. Do not turn the fish. 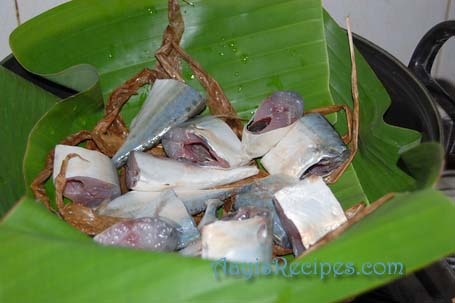 It gets cooked well and all the aroma of leaves, teppal etc get absorbed by the fish. Gosh I can just imagine how good this tasted! I do love mackeral, and what an amazing way to prepare it! loved the recipe.. BTW do u have any substitute for bombil? here in US….. I came across a very similar preparation in Bali (Indonesia). The dish is called Ikan Bakar and they use banana leaves as the cover. We were searching for ‘Indian’ testing fish preparation and a native suggested this. I thought I would share it with everyone. I live in Toronto. I get frozen Mackeral here but I dont get turmeric leaves or bana leaves. How do I cook this in oven without the leaves. Could you please tell me as I Love this dish and I have been eating this since childhood at my aaji’s place. Please to keep the great tredition every konkani must prepar this dish often otherwise our childern certainly miss this wonderful food.Thanks to AAyi. thanks for such a wonderful recipe…i love this …my mom calls it haldichya panatle bangde…just managed to get haldi leaves and tirphala from mumbai …but cant find mackerels in new jersey…the spanish mackerel is too sweet ..once i had seen some fish …gulungal…in chinese stores..looked similar to mackerel…do u think is that the right type ? or any idea what other fish can i try this recipe? I use Spanish Mackerel for this. No idea about other fishes. I moved to the US recently and have to trying to locate fish of our kind – like the ones you get on the west coast of India. I wanted to know where I can find Bangda – mackeral – there was some varieties of mackerel at the Ranch 99 stores here in California – but are they similar in taste to our Bangde? Which mackerel here taste closest to our bangde? Do they have Bombil/Bombay Duck here in the US or a fish similar tasting? Can you name the Chinese stores you find fish at? Also I am very curious to know if they have sukke maase – dried bangde like we get in India? Do we get fresh surmai/king fish here in the US? Sorry for asking so many questions – but I am total fish fanatic and I havent found much more than black pomfret here. We get Spanish Mackerel here which is similar to King fish. Many of the Indian groceries carry frozen fishes. Ask around someone who lives in CA for more details. 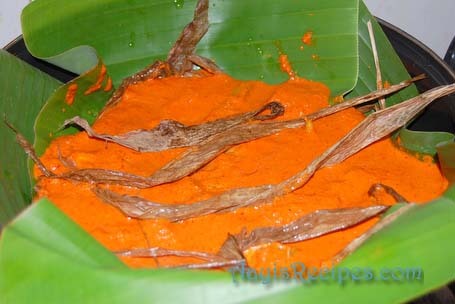 What is the alternative to haldi leaves in this recipe? Will halkunda – fresh haldi roots do instead? Or even halad – the powder? 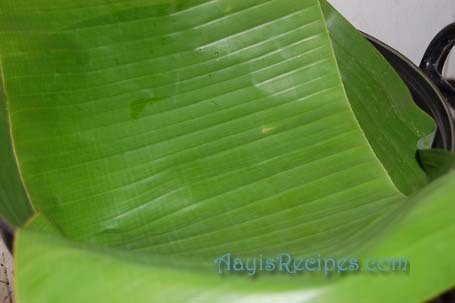 You can use banana leaves. very tempting. thanks shilpa for all these delicious recipes. my dadi used to make this dhodak. after her, i never tasted it. i’m from goa but no one knows how to make. i’ll try it. I recently came accross ur website. I am married to Jain so obiviouly a NO for Non-Veg. I miss all this food. The only way I satisfy my cravings is thru ur recipes posted. Wonderful Dhodak… one of my all time fav. is white pomfret diet fish?? (patte meenu).. I will try this when i go to india. Trying to find banana leaf in the US is a hit and miss. Trying you alle kande ambat today.